Let the Real Treat be You. When I was younger, I always carried sugar in my pocket because it felt so great to have my horse come to me. It was cheap vanity- until the inevitable day that I forgot to fill my pocket. My gelding stood on my 5 year old foot, begging for a treat I didn’t have. I was pinned- without enough muscles or brains to move him back. He started to get more aggressive and finally I wiggled my tennis shoe out from under his hoof. My trust in him was bruised as my toes. Sugar has a darker side! It is easy to know who the alpha horse is in a pen- just toss an apple in and see who gets it. What we might call food aggression is just common sense in the herd. We give treats to dogs as a reward for a behavior. Dogs find out the treat isn’t free and they happily comply with the command- it’s a fair trade and a door opens to understanding and working together. Feeding a thousand pound horse a treat without exchange of behavior is a different thing entirely. Horses don’t care that you think you are giving it, they just take it. No debate. You might even think that your horse is being affectionate when he is doing a body search for more food to take. Your vanity is rewarded, but dominance is also settled. You’ve lost and you aren’t tacked up yet. 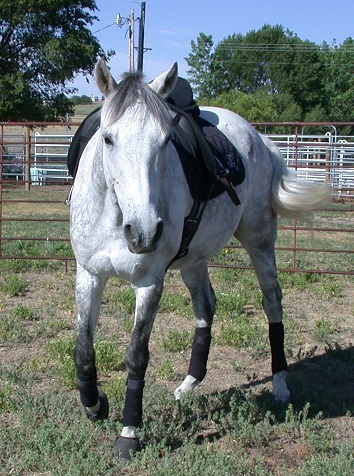 Exceptions exist, some horses aren’t as food motivated as others- some riders are smart about treats. Herd dynamics are complex and horses frequently understand more than we are aware. I choose to not hand feed my horses- call me cruel, but I still remember not having the currency when I needed it. Most of all, I want evolve my leadership beyond food. A few weeks ago, my horse fell with me while cantering. He got hung up in the fence while getting up, took a nasty scrape to the groin, and scared himself pretty badly. (I was fine.) Nube’ was at the end of the arena shaking by the time I got to my feet and clucked for him. He swung his head towards me and trotted back with a big sigh upon arrival. He didn’t come to me for a treat, he knew I had something he wanted more. Good leadership is the best treat for a horse, and apparently, a rider can still be vain about it! ← From a Whisper to a Scream. Wow Anna, loved this post!